Representative Eric Swalwell, Democrat of California, at a news conference in 2014. At 37, Democratic Representative Eric Swalwell has risen quickly. In 2012, the Californian unseated an incumbent Democrat whose tenure began before Swalwell’s birth. Soon after entering Congress, he helped start a bipartisan group of freshman legislators dedicated to finding areas of agreement. Two years later, he started a group of young House Democrats focused on issues crucial to millennials. In 2016, his party’s caucus gave him a key leadership post, on the House Intelligence Committee. He supports Nancy Pelosi for House speaker, arguing that she’s a skilled leader who knows how to count votes and pass progressive legislation. He’s tech-savvy, good on television, and an effective fund-raiser in the Democrats’ efforts to flip the House in next week’s midterm election. As all this suggests, he’s popular among his peers and good at working within his party and the system. But what makes him unique — especially among the platoon of Democrats eying the presidency while feigning indecision — is his candid contemplation of seeking the party’s nomination in 2020. This ambition underscores the import of his personal history and political vision. His life before Congress reflects the struggles ordinary Americans face. His father was a police officer, his mother a secretary. They worked hard, saved religiously, and moved from one rental home to another in pursuit of better schooling for their kids — chasing their piece of the American dream from Iowa, through Oregon, to California. By the time Swalwell finished high school, he’d worked multiple jobs and lived in 11 homes. He became his family’s first college graduate, interned in Congress, completed law school, and became an assistant district attorney. The price tag was over $100,000 in student debt that he’s still paying off. Democrats must meld their calls for racial and social justice with reclaiming their identity as the party of economic opportunity. With that, Swalwell says, came his father’s sense of right and wrong. After becoming chief of police in a small Iowa town, Swalwell’s father challenged town leaders who expected special privilege. After he issued tickets to town fathers who parked in fire lanes at a crowded local fair, they fired him. But the example stuck: Swalwell watches in disbelief as his Republican colleagues, knowing better, countenance Trump’s entanglement with Russia for fear of losing their seats. A prime offender is the House Intelligence Committee, transformed by Republican Representative Devin Nunes of California into a weapon against special counsel Robert Mueller and the FBI. 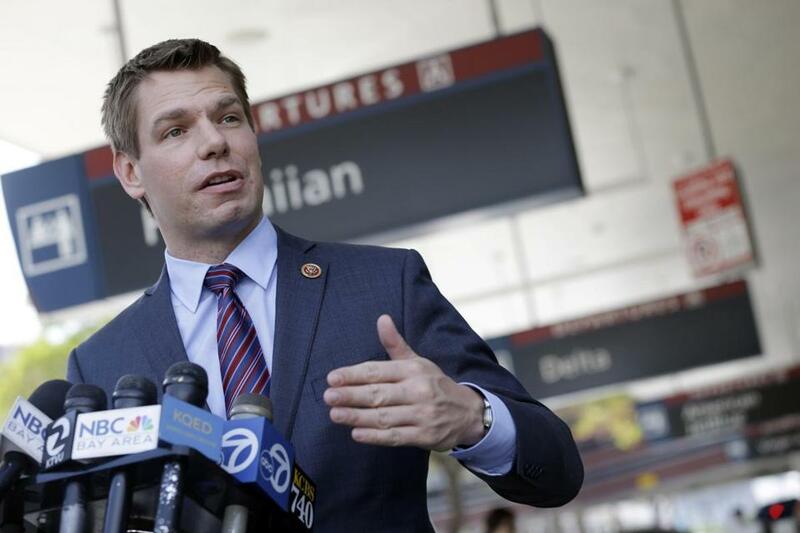 Should Democrats retake the House, Swalwell told me in an interview, they should revive its investigation of Trump and Russia, protect the Mueller probe, and seek an independent commission to study Russia’s electoral interference. In addition, they should investigate potential ethical breaches and self-enrichment involving Trump and his family. Legislatively, he proposes a progressive agenda on issues that might draw bipartisan support — including those about which Trump has spoken favorably: universal background checks for gun purchases; legal status for Dreamers; protecting health insurance for those with preexisting conditions. That would put Trump to the choice of collaborating — or obstructing. All this, of course, bears on the 2020 presidential race. So how can Democrats beat Trump? It’s imperative, Swalwell answers, to engage the 6 million Obama voters who didn’t vote in 2016, the Obama/Sanders supporters who voted for Trump, the multitudes repelled by partisan grandstanding, and the millions of young people who no longer believe that government can do big things. This involves more than dollars and cents: it’s about reviving the dream of betterment that sustained his own family but now, for too many, feels like it’s slipping away. To that end, he proposes universal pre-K, affordable college, and eliminating interest on student loans from government. Young people who commit to public service should have loans forgiven more swiftly. Government should invest in infrastructure, public education, and small business development. To help working parents, it should pass paid family leave and a child-care tax credit. More broadly, Americans should be relieved from fear that preexisting conditions, or catastrophic illness, will bankrupt them. They should understand that Social Security and Medicare are safe. They should know the government is working to protect them from gun violence. Finally, Swalwell addresses the fraught issue of immigration: protecting Dreamers, reuniting kids separated from their families, providing a path to citizenship for undocumented workers, and allowing our businesses to attract the skilled immigrants they need while strengthening border security and removing undocumented workers convicted of serious crimes. Traditionally, he says, we have welcomed immigrants of all faiths and backgrounds — we can’t scapegoat refugees for problems they have nothing to do with, and still claim to be good Americans, or good humans. Still, Democrats have never lacked for programs. What’s been missing is a unifying vision. 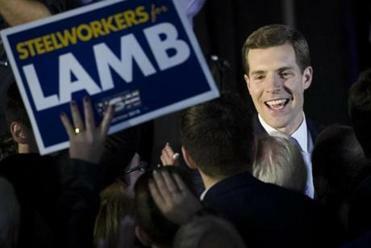 For Swalwell it’s restoring “the freedom to dream” — the animating belief that Americans can make their lives better, and better yet for the next generation. Regardless of whether Swalwell runs in 2020, this is a worthy message for Democrats. Trump has already given us his alternative: anger and division. There is no good future in that. Richard North Patterson’s column appears regularly in the Globe. Follow him on Twitter @RicPatterson.